It started with Halley’s comet, it must have. It was 1986 and Mom and her friend Irene took me and my sister out to the field beside our Indiana church in the middle of the night. I only remember the cold and the darkness. The comet, if I even actually saw it, was underwhelming. But it didn’t matter. The grown ups said this was a big deal and I believed them. I’ve been believing them ever since. When my sister told me about the total eclipse a while back, I started to make plans to get myself into The Path of Totality because of course. We live about a three hour drive from both Columbia and Greenville, South Carolina, two cities directly in the path. Of course I was going to drive to see this. I’ve driven for less than this. I’ll drive out of our tree-filled neighborhood at bedtime on the night of a full moon just to catch a glimpse. I drove around Santa Barbara in the dark every morning for four days while visiting just to see the sun rise over and over again. When we go to the beach every summer, John and I wake up before dawn so we can drag our beach chairs through the sand and watch the sun rise up over the water, the regular sun on her regular path. My family knows if the sun is setting or the moon is rising, it’s fair game that I might pull over to the roadside to catch a glimpse or a photo. When the moon is blood, strawberry, full or crescent, I want to see it and am always delighted by it. Summer and winter solstice are my twin muses, the longest day and the shortest day ushering me into reflection with their shadows and light. When the space station flies over our cul-de-sac, we track it. If we’re in a dark part of town, I look up to see the stars. My blog for years was called Chatting at the Sky. Annoying, but also telling. For a woman who so loves the sky, I’ve still never seen the Milky Way, the Northern Lights, or a total solar eclipse. A weekend of travel and a Monday night school open house left little room for our family to drive six hours in one day and make it back in time. There was much conversation around this. There may have been tears on my end. I may have reverted back to being a child and stomping my feet. I may not have. You’ll never know. 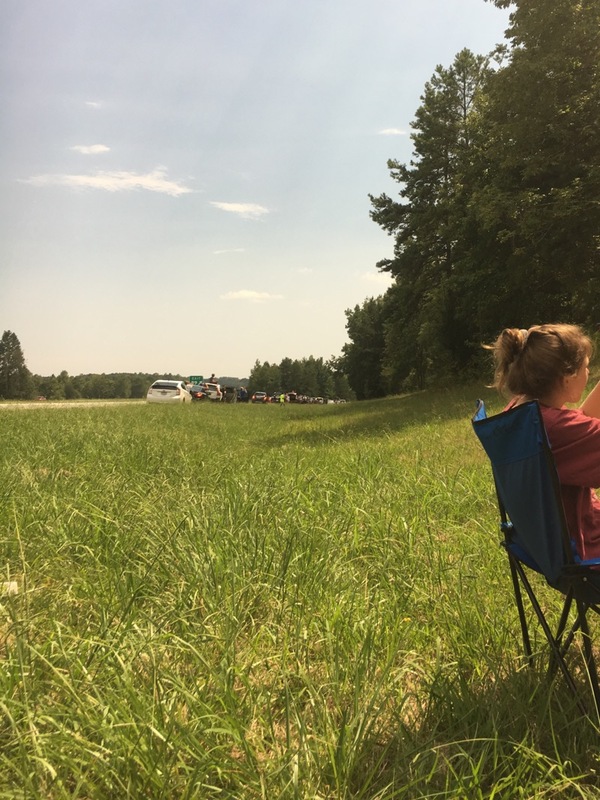 I made my precarious peace with it and on the day of the eclipse, we headed out to a local field to take in the 94 percent partial eclipse we would get in our own hometown. Not the same, but something. “Seeing a partial eclipse bears the same relation to seeing a total eclipse as kissing a man does to marrying him, or as flying in an airplane does to falling out of an airplane. Still we headed out and pitched our chairs. But when the clouds rolled in just before the eclipse started and the rain began to fall, my heart sank all the way down. The total eclipse was already lost to me and now we wouldn’t even get a partial? I convinced my family to jump in the car and head south. Follow that patch of blue sky! With my sister-in-law and her family behind us and another friend and her daughter behind them, we rode down the highway three cars deep in the yellow, fading light. Ten minutes out of town, we made it to sunlight, pulled over in a gas station parking lot and yanked out our glasses. During a partial solar eclipse back in tenth grade, our Spanish teacher let us go outside but warned us to not dare look up, so this was my first time seeing an eclipse with my own eyes through glasses. And still, it was surprising to see. Oh, they’re right. It really is happening. We shared our glasses and squeals of delight, and decided to find a better place to watch the whole thing. We hopped back in the cars and found a patch of sunny grass a bit down the road, a line of cars already stopped, all eyes trained on the sky. Watching the whole thing unfold was a gift. And even though it never got dark, it did get dim, a yellow I’ve not quite seen before. We felt the temperature drop and kept blinking our eyes, adjusting to the strange light spilling onto the world. The darkening was only gradual for those of us standing beneath the 94% partial eclipse. And that was all we got – a gradual dimness giving way to a gradual light. This time, we take the show we got. And though it wasn’t totality, it still happened. I try to imagine in my mind what it was like for those of you in the path of totality, close my eyes and try to give life to what I’ve read and the photos I’ve seen. I’ve watched countless videos online, but everyone says there’s no way to capture it with a camera. I know you have to be there to know what it’s like and I kind of love that about it. Turns out God still makes things we can’t capture on Instagram. How about that? Still, we try. And I’m glad for that, too. And it is, for all of us. Because even if we weren’t able to see it with our very own two eyes, just the fact that it happens at all is a humbling experience. There was no delay and no hurry. There was no celebrity who could outshine it, no amount of money that could control it, no power that could stop it, and no politician who could take credit for it. No one could vote for or against. We could only bear witness. For a few hours on a Monday in August, that’s what we did here in the United States and I just loved it. But I have to admit, I’m sad to have missed the total eclipse. It feels silly and childish to admit, but there it is. For me this week, the disappointment is real, but the deeper question is why. It’s one thing to admit when we feel let down, but it’s another to let our disappointment lead us to our center and enter further fellowship with God. I’m learning not to discount or throw away those times when I feel left out or let down. So I took some time this week to consider the question beneath the question. For those of you into personality typing systems, I’m an enneagram four and an INFJ on the Meyers-Briggs, so I live in a world full of meaning, connection, and possibility. I pay attention and intuit what’s going on beneath the surface of things. I value beauty and wonder and at my best, I have the ability to take an experience and put it into language the soul can understand, process, and apply. But the shadow side of all of that goodness is I also have a tendency to be dramatic, self-obsessed, full of shame, and a stubborn belief in the false narrative in my head that I’m missing something vital I need for life. And worse, everyone else has it. And oh yeah, they’re all in on the secret and I’m the punchline. It’s dark and weird and self-indlugent, but missing that path of totality somehow touched on that for me. As I’ve thought about it, I realize that creation is one way I experience God and understand life. And missing that cool experience felt a bit like God passed by in the world and I was on the wrong end of I-85. That isn’t true, of course. But that’s where the disappointment comes from. Creation and all of the mysterious beauty within it is life-giving. While it isn’t healthy to demand all our experiences be life-giving, it’s important to pay attention to them when we recognize them. I don’t think we do that enough. But here’s something I’m loving: watching all the videos online of people who were in the path. I cannot get enough! It touches me to my core to see everyone respond the same way no matter your gender, age, race or status. If you’re feeling a little sad over missing the total eclipse, it could help to ask yourself why. As for me, I’ve been reminded that God is with me, even in this small disappointment. He’s always inviting us deeper in and further on, willing to let even the silliest things draw us closer to him. And while I’ve always known I love the sky and the light and shadows that dance above us everyday, now I’m taking it all a bit more to heart, making a list of things I’d still like to see simply because they bring me joy. Next time our country experiences a total eclipse, I’m planning to get myself and my people to the path of totality. We’ll save our approved glasses, take our colanders to look at the shadow bands in dappled light, and hope for a clear day in Indiana in April 2024. Want help to discern what is life-giving in your own life? This week’s episode of my podcast The Next Right Thing could help you do just that. Listen in to “Make the Most Important List” right here or download a transcript of the episode. Emily, I love you sharing this perspective! I’m praying that you, more than anyone, will witness the awesomeness in 2024!! Anticipation is half the fun, so enjoy the next 7 years like nobody’s business! Oh my gosh I love this so much – there is SO much truth and depth here, Emily! We were in the path of totality her in Lincoln, Nebraska, BUT it was kind of cloudy and I was in a big glass-half-empty panic out there in the prairie, stewing over the weather that I clearly couldn’t control. At one point I was moaning and groaning so audibly and emphatically that Brad had to quietly remind me not to ruin the experience for everyone else. And then of course I was mad at him for reprimanding me when clearly it was totally not fair that we were not getting the fullest, best total eclipse experience. It was still amazing and honestly better than I imagined, but it was also a bit fraught, and I think you have helped me understand why. So thank you for that. And thank you for letting me STILL complain emphatically about my not quite total eclipse experience. 🙂 Also I threw my eclipse glasses away and now just realized I am going to have to ORDER THEM ALL OVER AGAIN in 7 years. I love that you are crazy and real and share from your heart, Emily. I am the same way about the sky, sun, moon, stars, etc. Every month I print out a calendar of the sun set/rise times and moon set/rise times and phases, lol 🙂 Goodness, girl, get yourself a telescope so you can see the milky way! We were only at about 60ish % or something here is south Texas. My love got me some welding glass and I enjoyed every minute of viewing! The horizontal light became dimmer and the temperature dropped (which was a blessed thing!). I was a little disappointed that the “end of the world” predictions didn’t come true (kidding – not kidding) but maybe 2024 will fulfill those longings as well. Have a blessed week! I heard on the news that those glasses expire, so you’ll have to buy new ones for 2024. 🙁 But, you can donate the ones you have now to far away countries that are expecting eclipses later this year. I wrote a piece INCREDIBLY similar to this over on my blog (mytransparentheart.wordpress.com) right after the eclipse. I happen to live in Charleston, in the path of totality, and I STILL ended up missing it! Talk about disappointment. But it also taught me something so valuable about “missing out” even when we’re completely prepared. Thank you so much for your perspective. I’m so glad I wasn’t the only one a little peeved by the whole ordeal. To actually be in the path and miss it?!? Oh, man – you win. Emily, this is my favorite thing I’ve read about the eclipse. Thank you for doing the work it takes to capture the deeper meaning of both our collective and individual experiences. I, too, hope to see totality in 2024 and am starting to save and make plans now! Even though my family and I weren’t in a place to see the total eclipse, we still had a great experience. When the total eclipse happened in other places, our area dimmed to the point that the birds and bugs were tricked into thinking it was evening and the sun was going down. We stood outside and suddenly the birds stopped singing and the cicadas started and a couple of the street lights came on. There was a light breeze for just a moment. Then it reversed and the cicadas stopped and the birds again sang. It was just one of those surreal moments. What a creative God! Girl, I love your heart. I love your perspective about the “why” – I wish I’d thought of it. Planning that rip to Indiana! That quote from Annie Dillard. Thank you for putting into words (again!) all the emotions from this week. So very, very beautifully written, Emily…as always! Copying this from my Instagram post (private…but of course I would say yes if you were to choose to follow 😉) I don’t know how to post the pic and I have a mediocre video on my phone (I regret I didn’t set up a video camera of the crowd or get a solar filter for my camera). Your writing about the eclipse is so lovely and well said. After taking our oldest to college on Friday, I am so very grateful we had planned this “eclipse adventure/ distraction”. We were about a mile from you! Decided that morning to head down from Rock Hill, arrived about 30 minutes before totality, the park looked too crowded, so we pulled into a church parking lot. I’m so glad we made it, a stunning sight I’ll remember always. I did not really have a care about the whole thing, but got dragged into it–and was thrilled! We only had 93%. There were really amazing shadows on a cement wall through a tree that were incredible!!! I made a pinhole box and it was somewhat disappointing. 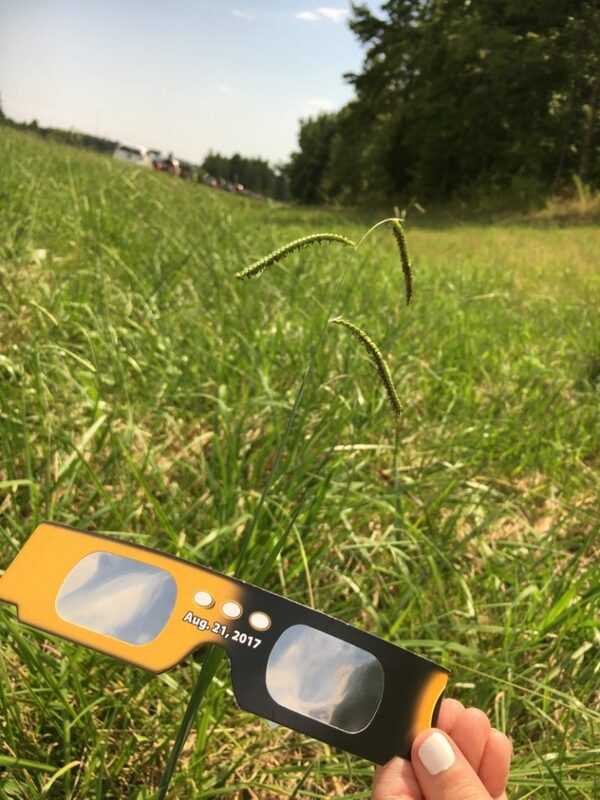 Through glasses, it was pretty cool…not knowing exactly what to expect, but being full of expectancy with everyone around having that same sense of…well, what will it be like, what is next? Certainly we should have that kind of attitude all the time as we serve a God who is greater than the sun and always finding things eclipse Him of so much lesser value. Thank you for your sentiments, I love them! In a world of darkness, wonder is often missing and so delightful when experienced and shared. Bless you! I am a lucky one who happens to live in the path of totality. I don’t say that to rub it in, but the experience and sadness of missing it is a very valid one. Having experienced an awe I have never known, you MUST go, chase the eclipses to see with your own eyes a magic that just…has no words big enough to fully grasp. I love the way you express yourself. I’d love to land where you are during the 2024 eclipse, so you may help me articulate what happens inside the soul of a person who sees it. 🙂 All I’ve come up with so far is the most deeply penetrating awe and beauty when darkness and light are in full alignment. All of humanity paused…a moment of silenced washed over this country and for a moment…there was unity. You are the best. Thanks for sharing this. We went to our library to watch with friends, which was a delight! Although it didn’t seem to get dark the street lights and parking lot lights came on. I loved the coolness in the air and how quiet it seemed. We’re thinking of Indiana in 2024 too! It was too cloudy here to see our 86% as well. The last one though less covered than that was at least a clear day and it cast really cool shadows thru the leaves of the trees onto the ground, but the next one we will be only an hour away drive to totality! Looking forward to it. What a helpful post. I am also an enneagram 4 and an INFJ. I love how you describe how to pay attention to disappoints and process those. We took the day off work and drove 8 hours to go see the total eclipse. There were others I knew that were going and when I saw their facebook responses they were all spiritual and profound. Normally that is my vibe but not this time! I just had a really fun time hanging out as part of my little family of 4. The kids were still moaning and messing around and my husband was obsessing over his camera and it was just another day in our family life that had a big fun rare reason for us to be in the middle-of-nowhere Oregon with special glasses. It got twilight dark, not nighttime dark, but it did get blissfully cooler. And then we got back in the car to drive a long way home. I’m still worn out, but it was worth it. N.B. – don’t throw the glasses away send them to Astronomers without borders so others can use them! Hey all, our family drove 2 hrs to experience totality. I was so thankful I knew what to watch for because the 2 min goes quickly. At totality we took off our glasses. No picture nor video simulation does justice to the magical reality!! We stood in darkness with a ring of “sunset” on all horizons! Looking straight at the sun without glasses we saw the “ring with brilliant shining diamond” around the circumference. We saw the corolla (rays of sun spreading out far into the sky). Venus was to the left. There was a bright flash that was so incredibly beautiful I was awe struck. My eyes may never see again this side of Heaven the glory I witnessed. I will marvel at the sight all my days. i’m with you on so many fronts, especially infj, can’t ever seem to get my fill of the sky. one of the sweetest gifts in the past few years is needing to run at sunrise…i’d never pick this time on my own (it means stumbling around on rocky/uneven/hilly dirt roads in pitch black for the first ten minutes), but when the sky wakes up it does glorious things. and every morning is different. where we live, we had a 0% eclipse, ha, but we’ll have a full lunar next summer. just a wee bit excited already. Dallas for us in 2024! I am so like you Emily in my obsession over the sky! I love sunrises and sunsets and photograph them all the time. I’ve been known to wake up at 3:00 in the morning and lay on the grass for hours to see meteor showers, I had a telescope once even, I get up in the middle of the night when I’m in dark sky territory to star gaze. In 2014 my husband and I went to Lapland in Sweden on a tour to photograph the Northern Lights. Amazing!!! So when this eclipse was to happen we drove over 300 miles to KansasCity where I gre up, to see the total eclipse. It rained cats and dogs the morning of and then the sky cleared and we drove to a place to see it. We had a wonderful time observing it come near totality and we noticed the clouds were thickening and getting darker. We saw it make the “diamond ring” right before it went total and BAM…clouds went in front of the sun and totally covered the moment of totality. Like you…I was so sad it wasn’t to be. The pinnacle moment and it was missed. It was like Mother Nature said “screw you!” Really…the audacity! So I am extremely disappointed that I was “that close…and then to have it grabbed away from me”. So yes, I’m going to Dallas in 2024 and that’s that! By the way, if you ever want to see the Northern Lights…go! Abisko, Sweden has a microclimate with the clearest sky’s to observe. I didn’t want to chance the clouds in Alaska to ruin it for me. So that was a wise decision. Thank you for your wonderful writing…love it so. I was looking forward to this eclipse for 11 years, and so had a lot of expectations, and even when the eclipse was weeks and months away, I felt disappointed in myself for not making plans until after the hotels in totality had been booked, and other preparation matters. I had a lot of anxiety before the eclipse due to the iffy weather forecast in Nebraska, and wasn’t sure if I’d have to book it from my campsite in western Nebraska to Wyoming at 5 a.m. Wondrously, everything did come together and I was able to see the total eclipse, but I still had a sense of regret: That there were too many cool things I was trying to see in under three minutes that I wasn’t as fully present as I would’ve liked, that there wasn’t enough silence, that I wasn’t in the most scenic spot, etc., etc. Especially as a perfectionist, it’s really easy to feel like I “did it wrong,” especially when it’s such a narrow window for something that is most certainly a long-anticipated, once-in-a-lifetime experience for many. Working on giving myself grace, and holding close the joy that I did have, and still do have when I think on it. Thank you for sharing that, Lizzie. You articulated that lingering sense of regret that can sometimes follow us even when everything is going right. Sometimes I wonder if that’s not part of being human that will never really go away until heaven. We are in Sabetha, KS right in the line of totality. It was partly cloudy and the clouds kept covering, uncovering the partial and then this thick cloud covered right before totality. So it was still humbling (love SJP enthusiasm) and amazing (I cried a bit) – sky darkened, we could see Venus in a clear area, the birds stopped chirping, the humidity was gone and it was peaceful but not what it could have been (or was ACROSS TOWN. A lady today said she saw totality less than 1.5 miles away!!!). But God is still the best! Can you imagine thinking up something as creative as a total eclipse?!?! I felt so the same Emily…We couldn’t even get glasses and we weren’t in the path of totality either, but were also just a few hours drive away. I was in my backyard just trying to stare through a piece of paper pin hole camera I made and the kids were fighting (3 and almost 2 years old) and I was so let down and couldn’t figure out why! Thank you for putting your finger on this for me. So helpful. I’m definitely going to try and see the next one too. I was in the path of totality, North Charleston SC. However in the last few seconds before totality the few clouds that were out turned into a crazy thunderstorm. Just like God, we could see the evidence of it all around us just not the actual event. At first it was a bit disappointing, but when I reflect back on the events it still was a miraculous experience. I had planned to take my boys down to my hometown of Greenville SC to see the eclipse, but an unexpected death in the family derailed those plans and I wasn’t able to. One of those things where I had to trust Gods providence in this situation! Our house was in the 99.9% totality but, like you, I wanted to be in the 100%. We went to a showing at a church camp and conference center about 15 miles north of us and it was fantastic. Everyone clapped and we were able to remove our glasses at the 100% for about 2 minutes. Definitely try and get to the 100% zone if you can the next time. Such a glorious display of God’s perfection in the placement and size of the sun, moon and earth. This is wonderfully honest! I actually had to work all during our partial eclipse (at my library job….where we answered countless requests about the special glasses that we were not privileged to obtain), but admittedly wasn’t too upset about it. When I was in senior public (middle) school, we experienced a solar eclipse (can’t remember if it was total or partial), but the main thing I remember was the fear that I still find in my heart coming from the warnings that were emphasized about the damaging effects of looking without proper protection. It’s a personality thing…flaw, actually, and I have to learn to balance good common-sense information with living and enjoying the amazing things of life (not missing them all due to fear). Near the end of the event, a patron shared his glasses with my director, who in turn shared them with each of her employees, giving us a chance to run outside and at least enjoy a glimpse of this natural wonder. It was a small, but cherished gift, as I recognize that I too, fears and all, was feeling a little melancholy about missing the whole thing. I love this statement you wrote: “Creation and all of the mysterious beauty within it is life-giving.” I’ve always felt this, but particularly recognized it’s truth on the long drive home from this summer’s early vacation. I suddenly admitted my very real need to experience this life-giving effect (esp. from nature), much more often than once every year or so on a vacation. I hope to continue to cultivate these experiences (even if in a small way), even daily, because I think I actually need them. This morning I thought I should head over to your blog to see if you had published a new blog post since I was here last time. I was happy to read For All the Sad Americans Who Missed the Total Eclipse. As I read the first part, I was wondering what the surprise in this particular blog post would be. It turned out to be one of those blog posts that gave me a new perspective on how to twist a blog post. I like the way you write about nature. Here in Greenland we have a lot of northern light – but I have yet to see a total eclipse 🙂 Perhaps I’ll be able to do it next time in 2024. It’s my impression that we readers can learn from your natural way of relating experience and daily life to God’s grace. Sometimes God speaks to us through the beauty of nature. It led me to think about the difference between God’s way and our way. I’ll share on social media September 9. As you can’t quite get enough about the eclipse, you might enjoy this delightful reflection, if you’ve not yet read it. It will, I’m sure, make you laugh, but like your reflection, Laura also takes us on a winding path to consider something else entirely. Oh, girl. We were smack dab in the path (Columbia/Lake Murray) and still suffered heartbreak–cloud cover just at totality (and not in a position to move). I have tried and tried to get over it, to rejoice in all the wonderful things about that day–seeing most of it, being on the lake with precious friends, etc. I even tried to blog my way to clarity, writing to see if I could uncover a silver lining/the greater message. And? No. IT WAS RIGHT THERE. Totality was RIGHT THERE and we didn’t get to see it. Ten minutes of clouds. At totality. Still so bummed. First – I grew up on Lake Murray 🙂 At least from 6th grade until 11th grade we lived in Irmo. But yes – this is heartbreaking and I thank you for sharing it. It’s important to name our disappointments, to pull them out into the light and see what they have to teach us. Even if we set them down and still don’t have clarity, it feels healthy and right to name them and not discount them as silly or unimportant. You’ve done good work here, Cathy.